AIM To investigate how the rate of reaction varies using the Iodine Clock experiment with changes in temperature, different concentrations of substrates and the use of transition metals. BACKGROUND THEORY The iodine clock reaction was first studied by Augustus Harcourt and William Esson. 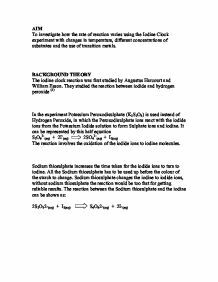 They studied the reaction between iodide and hydrogen peroxide (1) In the experiment Potassium Peroxodisulphate (K2S2O8) is used instead of Hydrogen Peroxide, in which the Peroxodisulphate ions react with the iodide ions from the Potassium Iodide solution to form Sulphate ions and iodine. It can be represented by this half equation S2O82-(aq) + 2I-(aq) 2SO42-(aq) + I2(aq) The reaction involves the oxidation of the iodide ions to iodine molecules. Sodium thiosulphate increases the time taken for the iodide ions to turn to iodine. All the Sodium thiosulphate has to be used up before the colour of the starch to change. Sodium thiosulphate changes the iodine to iodide ions, without sodium thiosulphate the reaction would be too fast for getting reliable results. The reaction between the Sodium thiosulphate and the iodine can be shown as: 2S2O32-(aq) + I2(aq) S4O62-(aq) + 2I-(aq) Rates of reaction The rate of reaction is a measure of how fast a reaction occurs. If the reaction fast then the rate of reaction is high but if the reaction is slow then the rate of reaction is low. For a reaction to occur the particles must collide with sufficient energy to overcome the activation energy. Activation Energy The activation energy is the minimum energy needed to for a reaction to arise between to colliding molecules. In fast reactions the number of molecules moving fast enough to overcome the activation energy is high so more reactions take place easily; in slow reactions the quantity of molecules that move fast enough to overcome the activation energy is low so the rate of successful collisions will be low therefore the rate of reaction will be low. ...read more. = Mr (molecular mass) x Moles We need to work out the molecular mass of Potassium Iodide (KI) Element Mr Potassium (K) 39.098 Iodine (I) 126.904 Total Mr = 166.002 We have the molecular mass now we can work out the mass needed. Mass = 166.002 x 0.25 = 41.501g To make the solution follow instructions on page 8 Standard solution of Potassium Peroxodisulphate (VI) (K2S2O8) We need to calculate how many moles we need. This can be worked out by this equation: Number of moles = concentration x volume We will be using 0.040 mol dm-3 of Potassium Peroxodisulphate (K2S2O8) and making 250cm3 of solution. The 250cm3 needs to be converted in decimetres cubed (dm3) so we need to divide 250cm3 by 1000 to get 0.25dm3 Number of moles = 0.040 x 0.25 = 0.01 moles Now that we have worked out the number of moles we can work out the mass of Potassium Peroxodisulphate (K2S2O8) needed by the following equation: Mass (measured in grams) = Mr (molecular mass) x Moles We need to work out the molecular mass of Potassium Peroxodisulphate (K2S2O8) Element Mr Potassium (K) 39.098 x 2 = 78.196 Sulphur(S) 32.065 x 2 = 64.130 Oxygen (O) 15.999 x 8 = 127.992 Total Mr = 270.318 We have the molecular mass now we can work out the mass needed. Mass = 270.318 x 0.25 = 67.580g To make the solution follow instructions on page 8 Once all the standard solutions were made I set the apparatus listed below as shown in Diagram 1 Equipment needed for experiment: Burettes x4 Pipettes x1 Funnels x4 Test tubes x5 Boiling tubes x5 Test tube holder Clamps x4 Beakers x4 Stop clock Starch (freshly made) Potassium Peroxodisulphate solution Potassium Iodide solution Sodium Thiosulphate solution Distilled water Diagram 1: This experiment is to see how fast the starch changes colour. These are the amounts of each solution I will be using. ...read more. /cm3 Volume of Starch /cm3 Volume of K2S2O8(aq) /cm3 1 5 0 2 1 2 2 4 1 2 1 2 3 3 2 2 1 2 4 2 3 2 1 2 5 1 4 2 1 2 The results I received from doing this experiment are: Mixture Test 1/ Time taken (s) Test 2/ Time taken (s) Test 3/ Time taken (s) Average time (s) 1 33.47 31.93 32.43 32.61 2 45.47 43.91 54.69 42.02 3 80.50 76.72 69.09 75.44 4 149.44 131.28 145.18 141.97 5 374.56 355.81 437.28 389.22 Analysis of Experiment 2- changing the temperature From getting the results from the 1st experiment I decided to choose Mixture 3 as the mixture. Talk about temp increase etc why u chose mixture 3 Mixture Volume of KI(aq) /cm3 Volume of water /cm3 Volume of Na2S2O3(aq) Volume of Starch /cm3 Volume of K2S2O8(aq) /cm3 3 3 2 2 1 2 The results are as follows: Temperature (oC) Temperature (K) Test 1/ time (s) Test 2/ time (s) Test 3/ time (s) Average time (s) 30 303.15 95.53 95.62 89.62 93.59 40 313.15 47.66 55.32 48.78 50.59 50 323.15 28.31 27.60 30.25 28.72 60 333.15 17.38 16.00 17.56 16.98 70 343.15 7.41 8.15 7.79 7.78 Experiment- Using Transition Metal solutions The results I recorded for the transition metal ion solutions are: 1cm3 of 0.1mol of each transition metal was used Transition Metal ion solution Test 1/ time (s) Test 2/ time (s) Test 3/ time (s) Average time (s) Nickel Sulphate 96.50 102.12 89.47 96.02 Ferrous Sulphate 11.50 11.47 11.49 11.49 Zinc Sulphate 96.09 95.90 98.22 96.74 Experiment- Using Transition Metal Solids Transition Metal Test 1/ time (s) Test 1 mass (g) Test 2/ time (s) Test 2 mass (g) Test 3/ time (s) Test 3 Mass (g) Average mass (g) Average time (s) Nickel 48.15 0.501 46.18 0.507 51.43 0.508 0.505 48.57 Iron II 7.44 0.508 8.91 0.504 7.59 0.506 0.506 7.98 Zinc 73.88 0.502 73.56 0.507 72.71 0.507 0.505 73.38 Coboltous Nitrate 62.81 0.502 58.61 0.506 58.24 0.508 0.505 59.89 Manganese Sulphate 65.75 0.504 67.23 0.502 69.04 0.504 0.505 67. ...read more. the other data I used to work this value out was also accurate to 3 significant figures. H2SO4 (aq) + Na2CO3 (aq) --> Na2SO4 (aq) + CO2 (g) + H2O (l) Moles = Concentration (mol dm-3) x Volume (dm3) No. Otherwise, side products may come out which affect the yield of our final product. Also, the oxalate should be equally placed in the sintered-glass funnel to ensure best filtration. Sample Acid (Mg) Mass (g) (Mg) Moles ?Time (s) 4 Ethanoic 0.28 1.15E-2 1513 5 Sulfuric 0.27 1.11E-2 210 6 Hydrochloric 0.26 1.07E-2 573 Analysis Q: How does the molar enthalpy of reaction of magnesium vary with different acids, namely, hydrochloric, sulfuric, and acetic acids? 1 The theory also states that effective collision can be affected by the concentration of reactants and temperature. In this experiment, the concentration factor is being studied. 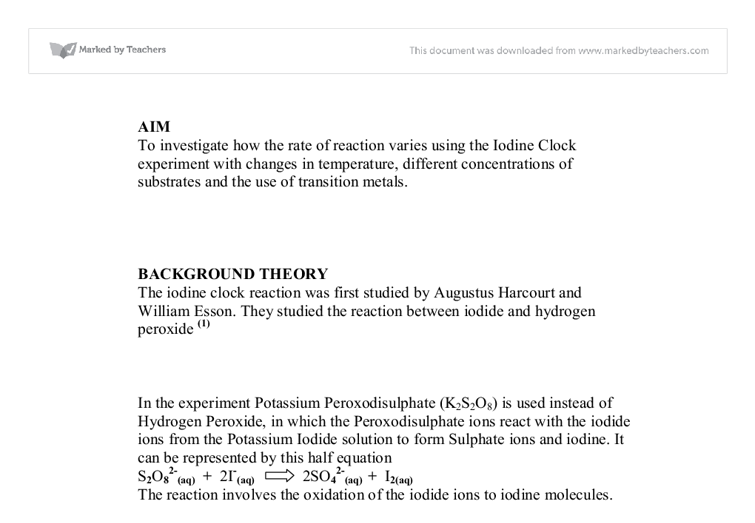 In terms of the iodine clock reaction, the concentration of iodide ions would, according to the Collision Theory, affect the rate of conversion of iodide to iodine. I would record the results on a table that I will have drawn out. I would then repeat the experiment with different splints. The splints contain the following metal salts: * Calcium Carbonate * Potassium Chloride * Sodium Chloride * Copper Carbonate In the experiment the dependent variable is the colour of the flame. The water molecules are then attracted to cation?s and anion?s respectfully . The water molecules are bonded to the salt molecules by intermolecular forces which aren?t as strong as the bonds between individual atoms. This explains why the salt can be heated and the water molecules can evaporate from the hydrate, forming an anhydrous salt (or a salt dehydrate).